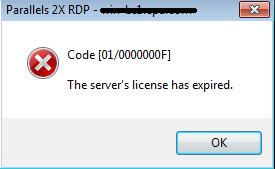 [01/0000000F] The server's license has expired. Wrong expiration date in RAS Console. Go RAS Console > Licensing > Activate... > re-enter your key and hit "Activate"
Note: If this is not the case, please restart Publishing Agent service and check the issue.